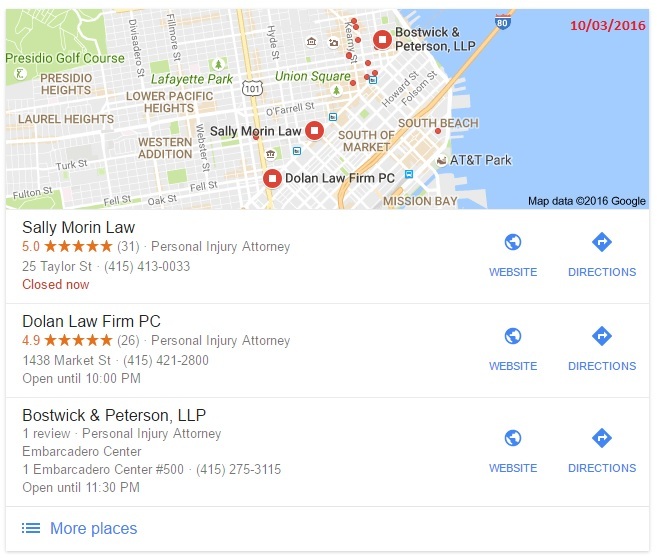 Having worked with personal injury attorneys in California for half a decade now I know the SEO scene and the law firms of California like the back of my hand. I have helped law firms rank in major cities where the competition is very fierce. 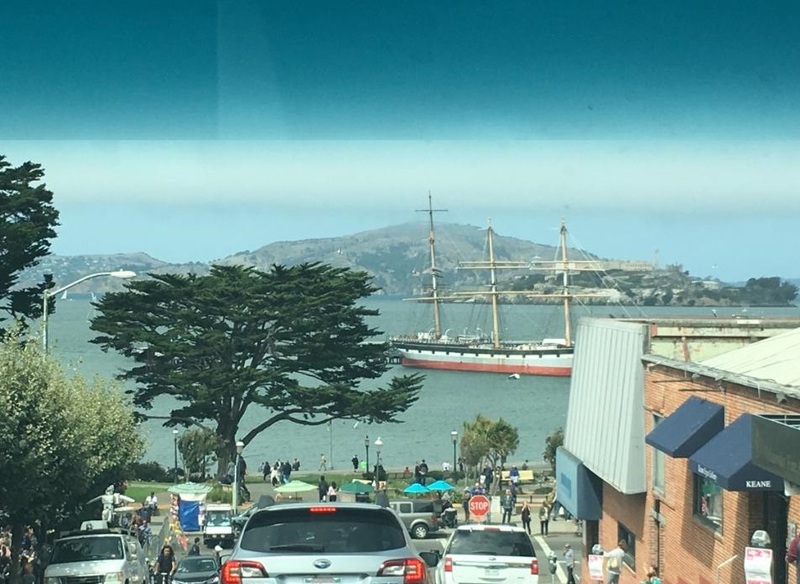 The City by the Bay interests me very much. I am retained and exclusive to most other parts of California but I am available in SF. I am not necessarily writing this due to that reason; I monitor personal injury search rankings all over CA daily anyways and I am mostly just documenting one of my digital journeys today in this post. What is great about San Francisco is the fact that nobody here really has a terribly dominating Internet presence. Sure, Sally Morin Law, Dolan Law Firm PC, and Law Office of Daniel H Rose have done a great job with reviews. But no one site is that powerful, and nobody has really gone crazy with content in the area like you see in Los Angeles and Chicago. Combine this with a growing population of around 850,000 and you have a unique opportunity to reach people online and obtain cases from the web. My team and I create custom content that ranks and converts for a wide variety of law firms. Aside from the cap on non-economic damages in cases of medical malpractice, California’s pure comparative negligence’s rule, statute of limitations and other personal injury laws allow for a very wide variety of content to be crafted up local to any city. 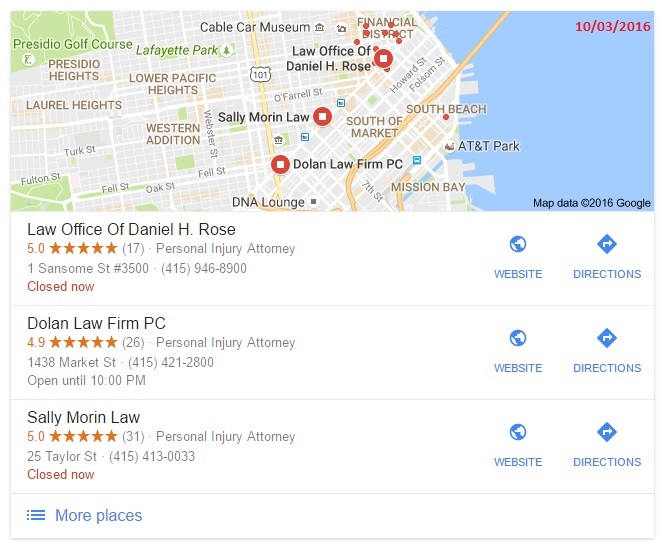 Most San Francisco attorneys have put together pages for their main areas of practice such as “car accident”, “bicycle accident”, and “wrongful death”, etc. Some firms have many more pages and a few have blogs, otherwise, the Bay’s waters are not nearly as saturated as they are in some cities such as LA. In fact, some attorneys from San Jose, Santa Rosa, Palo Alto, and Oakland have been putting out a little SF content here and there. Hot on the heels of Google Penguin 4.0 is my October update of SF Bay. Mary Alexander & Associates, PC #1, nice. Mary Alexander has been practicing for 25 – 30 years and is affiliated with all sorts of associations and just sort of ranks naturally. This is a rare find and is almost how Google “wants” search results to work. This is a custom WordPress site. Bostwick & Peterson, LLP Currently this site is #2. This is an interesting site with lots of content on it. Law Office of Daniel H. Rose I like Dan’s blog. I think he types the short articles himself. This is another basic WordPress site that does what it needs to do. Jones Clifford Another WordPress based site. This one has a long history of nice settlements and appears to be another great law firm. Also on the front page is the Dolan Law Firm and The Cartwritght Law Firm. Please do note that these are subject to change at any given time, even multiple times in one afternoon. And, of course, just because one firm ranks higher than the next does not mean that one is “better” than the next one. Unfortunately, I do not have any screenshots of the local pack (aka maps results) prior to October 3, 2016. I am sure though that these were shuffled around quite a bit in September. September brought many changes to the algorithm, the Penguin update and also the Possum update, which affected local results for law firms. Up until Possum, there was a very strong correlation between local rankings and organic rankings. I am not going to “out” anyone here and I can honestly say I am shocked by the lack of link-building which has taken place. (In case you didn’t know, links help you rank better. I could write a book on the topic but that is the dangerously short version of the story). Need Help ranking in San Francisco? If you are not getting leads off of the web or would just like to clobber your competitors I am the right person for the job and one of the few SEO people out there who have a thorough understanding of personal injury marketing. Over the years I have seen every trick in the book. I can help the right attorney rank the right way and have plenty of references available. I have been self employed for 20yrs and have over 20,000 satisfied customers. I have been online since 1988 and as for SEO I have more than enough law firms I could potentially put you in touch with if we are a match.